Austria held parliamentary elections on 29 September. Sylvia Kritzinger and Eva Zeglovits assess the election results, which saw the country’s two major parties, the SPÖ and ÖVP, maintain a narrow majority. They write that while the results mean the incumbent grand coalition will likely continue, the real story is the growing vote share for smaller parties which may lead to a ‘political earthquake’ in future elections. The general election in Austria can probably be described best by the two normally mutually exclusive words: stability and change. Stability, in the sense that again the two established parties, SPÖ and ÖVP, became the two strongest parties in Austria and will most likely continue to work together in the so-called grand coalition. Change, in the sense that the electoral results of the single political parties suggest major upheavals amongst Austrian voters without changing the government status-quo. Turning first to the electoral turnout, Austria experienced an all-time low in electoral participation. While in 2008 78.8 per cent of Austrians turned out to vote, in this election turnout declined to 74.9 per cent. Although in comparison to many other Western European democracies turnout is still comparatively high, it nevertheless indicates a change in the voting behaviour and voting duty of Austrian voters. However, the most interesting changes can be observed when examining the electoral outcome of the two government parties in comparison to the opposition parties. Though both SPÖ and ÖVP had already experienced an all-time low in vote shares in 2008, they lost even more votes in the 2013 election. Both parties lost around 2 per cent of their vote share and only marginally hold a majority of votes: the SPÖ received 26.82 per cent (a loss of 2.44 per cent), while the ÖVP received 23.99 per cent of votes (also a drop of 1.99 per cent). The Table below shows these results. This is an astonishing result given the fact that these two parties held more than 90 per cent of the vote share between the 1960s and the early 1980s, with their coalition governments being labeled a ‘grand coalition’. After this election, with the two parties holding a majority of votes by only a tiny margin (50.81 per cent), the term ‘grand’ not only seems to be outdated, but also shows that these two formerly major parties are close to losing the majority which they have been able to count on for decades. 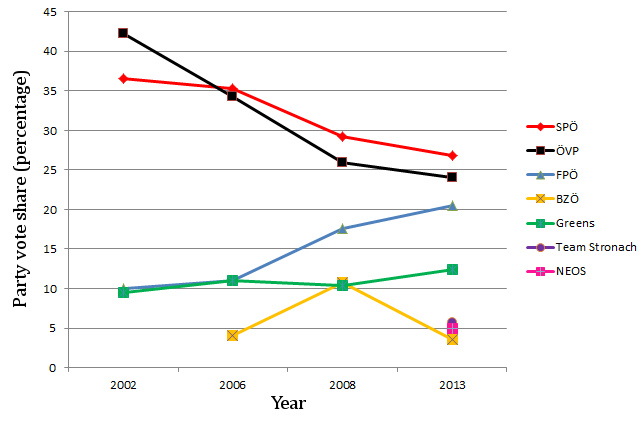 The Chart below shows the change in party vote shares in the four parliamentary elections held since 2002. Meanwhile, the opposition parties could in general gain (substantial) vote shares. The Greens gained 1.99 per cent and now hold 12.42 per cent of the votes. Overall, opinion polls suggested higher gains for the Greens, but in the end they remained rather static: neither making remarkable gains or losses. Also, Austro-Canadian billionaire Frank Stronach and his party Team Stronach were elected into parliament in their first election for the National Council, gaining 5.73 per cent of the votes. However, given its electoral successes in regional elections earlier this year and the self-proclaimed aim of 20-30 per cent of the vote, its result was interpreted by political commenters as a disappointment. Turning to the radical-right parties, FPÖ and BZÖ, different electoral fates can be observed. While the BZÖ failed to pass the threshold by only a small margin, gaining only 3.53 per cent of the votes (compared to 10.7 per cent of votes in 2008); the FPÖ once again increased their vote share by 2.97 per cent, and now hold 20.51 per cent of the votes. The substantial loss of electoral support of the BZÖ is based on several factors. Without its charismatic party leader Jörg Haider, a well-known radical-right leader since the 1980s who died in a car accident in 2008, and due to its involvement in some corruption affairs, the party could not repeat its success in 2008. In contrast, the FPÖ and its front runner Heinz-Christian Strache could continue with its former successes. The FPÖ ran a typical radical-right agenda, focusing on issues such as immigration, asylum and Euroscepticism, while criticising the established government. The surprise of the election day were the NEOS, a new liberal party, that managed to pass the threshold in their first election. In Austria, there has rarely been a liberal party in parliament, thus the NEOS’ success took a lot of people by surprise. Although the latest polls indicated that they might be able to enter parliament, it was nevertheless unexpected as they were able to immediately gain 4.96 per cent of votes. This is an astonishing result given that they were much less present on TV and in newspapers than the other parties. This is partly due to the policy of the public broadcasting company that invites only candidates of parties represented in parliament to their TV debates. Overall, the governing parties still have an electoral majority, one radical right party lost, while the other succeeded. Another populist party, Team Stronach, was elected to parliament. The Greens could not gain as much as they anticipated and a new liberal party, the NEOS, made it into the National Council. Most likely, the two established parties will continue their ‘grand’ coalition. Hence, even though Austrian voters seem to be rather dissatisfied with the performance of the government, they might get the same government as before. If so, the general elections of 2013 have not really changed anything. But if their decline continues this might have been the last election where the two old parties have gained a majority. The political earthquake is therefore yet to come. Eva Zeglovits is Assistant Professor in the Department of Methods in the Social Sciences at the University of Vienna.